I tried to get you all an exciting picture of a celebrity in exciting clothes, but hanging around doors celeb waiting is just not my thing. 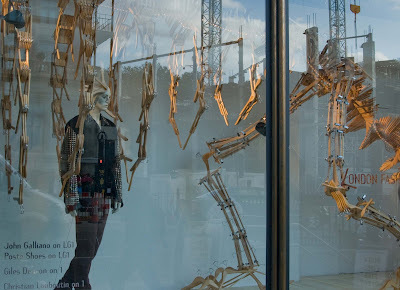 I liked this quirky window at Harvey Nicks (that's it's commonly known name. Really Harvey Nichols a terribly smart department store). They have a series of windows of dinosaurs made from coat hangers. I was trying to incorporate the building scaffolding over the road in this shot. Didn't really turn out as I'd hoped. Still that's my contribution to fashion week. I like this shot. When I visit London, I enjoy browsing in Harvey Nicks. I can't afford anything there, but it's fun to look. It seems I always end up buying someting in the food hall, though. An interesting mustard or an unusual jam is about my limit. I have had lunch in the dining room; pricey, but nice. I really like your shot, the woods hangers and the cranes reflexions place good to me, plus the manequim is all misterious..I love it! I have a dinosaur made from coat hangars in my closet! I like your version of fashion week better than a celeb shot- I can see those anywhere- this one is interesting! And clever! A dinosaur out of cost hangers..Clever..